We offer a complete line of residential and commercial services and over 25 years experience in furnace & duct cleaning, dry vent cleaning, chimney cleaning and repair. We guarantee all our work and we are bonded, insured with the State of Minnesota. After the first time you used our services, Craig from Dust Busters can guarantee you, you will come back and shop with us again. We can show you how to spend less money over time by showing you how to care for your home's duct work and more. That's where the trust is build and that is what this is all about. It's all about Trust! It's about trusting the people you let into your home! It's about getting the best job possible for the least amount of money. That's what we try to accomplish. Craig was in the heating and air conditioning business, and he also did duct cleaning for another company before starting Dust Busters. The company he used to work for didn't have their primary focus on cleaning duct work, it was on how many jobs can get done in a day. That always bothered him. We don't want you as just a paying customer or have a customer number attached to you. As a matter of fact, we do not attach a customer numbers to any of our customers. It is too impersonal to us. Craig likes the customer contact and doesn't like sitting in one place all day. We live in a small town and we service a lot of small towns. The people we see on the street, in movie theaters and at the grocery store, we build relationships with them, they are our customers. It's so funny how we get our phone calls during the day. “My friend had you over at their house the other day. How long have you known them? Oh, I just met them.” They act like we are their friends, and we kind of are. That is the relationship we are building with our customers! Craig has been duct cleaning now for 32 years! He tried some other things in the past and just always kept coming back to cleaning ducts. The primary reason why Craig started the DustBusters business was to be able to offer the best possible job for the least amount of money! People might think that's a horrible business plan, but Sam Walton used the same idea to start his stores and it worked. At Dust Busters we always try to give our customers the most for the least amount of money and try to find ways on how do a lot of it. We don't make a lot of money from each job, what we do make is a lot of relationships. The relationships we build is what makes our money and keeps us in business. Craig serviced a customer's house in Alexandria, MN. The customer was asking a lot of questions, we always keep our customers involved, and at one point he said "Why don't you come over and do my shop?" I said "Sure! What's the name of your place?" and he said "3M!". Well, that 3M account has evolved into a 14 year relationship. That's the relationship, we build trust with our customers. When Craig started his company that was his primary focus and it still is today and always will be. The customer comes first! Craig and his wife own the company, she answers the phone and he is in the field with his crew every day. We train our crew members (no prior experience), from taking their shoes off to the way they talk to customers. This takes about 1 1/2 years. We pay attention to all the small stuff regardless of money. The customer always comes before the dollar at Dust Busters! When Craig worked for somebody else he never found that. When he walks down the street he wants to be able hold his head high and when he runs into a customers he wants them to pat him on the back. That has a lot of value to him and that's the way he runs his company. That's the way his guys run the company as well. At Dust Busters they don't treat their employees as a number, they become part of the family. It's a family network and they don't just let anybody become part of the company, it doesn't work that way. We respect our customers homes, from taking off our shoes when we enter to walking around with little hand vacuums after the job is done. More importantly, looking at the bigger picture, if we can't fix something we will send them to someone who can, but we will only send them to somebody that we trust. A company or person that we know will not take advantage of them. We network with certain companies and we network with them because we know that they are going to take good care of our clients. A lady called Dust Busters on Valentine's Day from northern Minnesota. It was freezing cold out and the wood stove was plugged so she couldn't get any heat in the house. She had tried calling other companies in her area to fix the stove but none of them were able to get to her for over a week. Dust Busters showed up the very same day! The lady had been burning pine logs and the inside of the stove and pipe were filled with sap. Craig had to call out a second truck to help and it took them all afternoon to get the stove working properly again. The bill would have been around $1,600 but because her husband was in the military serving our country while stationed overseas and she was a school teacher working with handicapped children Craig provided the service for free. 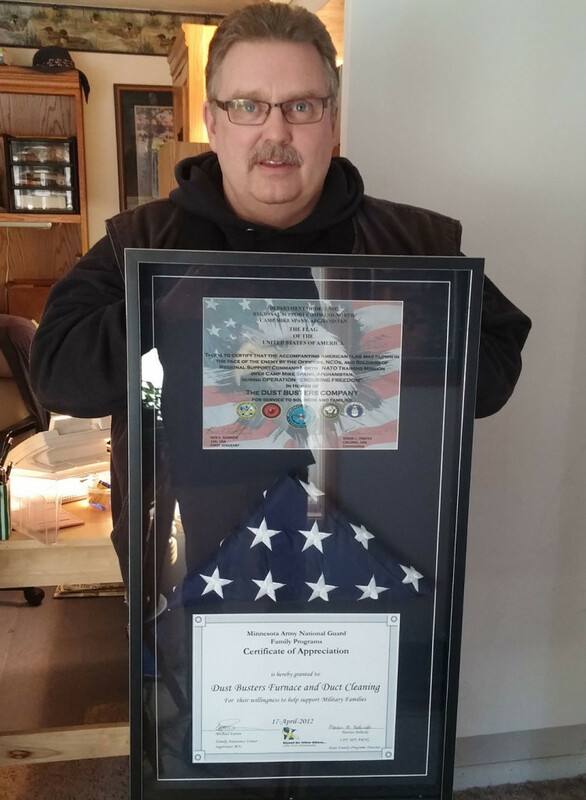 Several months later, after her husband returned from active duty in Afghanistan he made it a point to thank Craig in person and handed him a Certificate of Appreciation and the Flag of the United States of America from his military base to show his gratitude. All of us at Dust Busters are proud to be able to do this type of stuff. Any time we are able to help someone in need we will! To Schedule your appointment today, call us!